UV A and UV B Protection. Probably one of the most important thing to have on your glasses is the eye protection such as the UV 340 protection offered on all of our eyeglasses. This actually means that you are protected from both UVA and UVB at the 340 nanometer wave length and these are the most damaging rays so if you are out in the sun and catching a few rays remember to protect your eyes first and foremost. Scratched lenses, there is nothing worse than trying to watch TV and there is this blurry strip and it is always right down the middle of the lens. Actually there is a reason for it being in the middle of the lens an d if you think about it it makes sense. Lenses are convex on the outer side so the highest point and the first to come in contact with the floor when dropped or the desk when tossed. So fix the problem with Scratch Resistant coating. Although our State of the Art coatings offer the best form of protection you still need to be diligent in your efforts to protect your Spectacles from being scratched. One of the worst thing you can do to your glasses is to clean them with tissues. Sounds odd but true. Tissues are made of wood fiber and act just like sandpaper on the lenses. 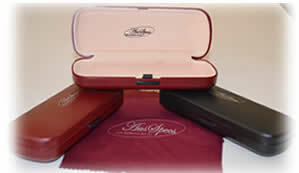 Stunning and Fashionable Spectacle cases are supplied free with your new glasses. Just imagine you are out at a posh dance of twilight meal overlooking the ocean and all of a sudden you need your reading glasses to make a selection from the menu. Well I am sure we agree that prescription sunglasses are more than just another option so jump to it and order your prescription sunglasses online now ! * Cases vary over time.